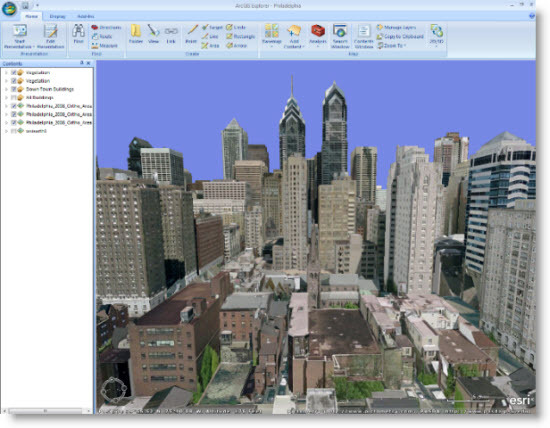 Virtual 3D cities and geodesign in 3D are hot topics these days, and with new and upcoming technology the ability to not just view cityscapes, but do meaningful work, design, and planning around them, is increasingly becoming possible – and more portable. While many of these developments are part of core ArcGIS (as found in ArcGlobe, ArcScene, and Esri CityEngine) they are also now becoming more broadly available via lightweight desktop and browser-based applications to knowledge workers, planners, and city managers – where many geodesign decisions get made. While powered by GIS and GIS databases on the back end, new browser and lightweight desktop options are on the horizon. Here’s a peek at two prototypes which provide a glimpse into what our future might hold. The thumb drive includes an entire 3D virtual city stored in a geodatabase. 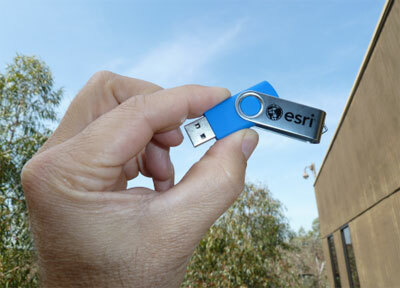 The thumb drive also includes ArcGIS Explorer Desktop 2012 software, which leverages technology evolved from the ArcGIS Runtime project to enable the application to run directly from the portable drive, without needing to install any software. Since this is a locally running application it includes functionality not yet practical in purely browser-based applications, including the ability to add local geodatabases to the cityscape, directly connect to enterprise data and workflows, use built-in query and spatial analysis functions, and also potentially include advanced GIS and geodesign tools made possible via the application’s extensible architecture. 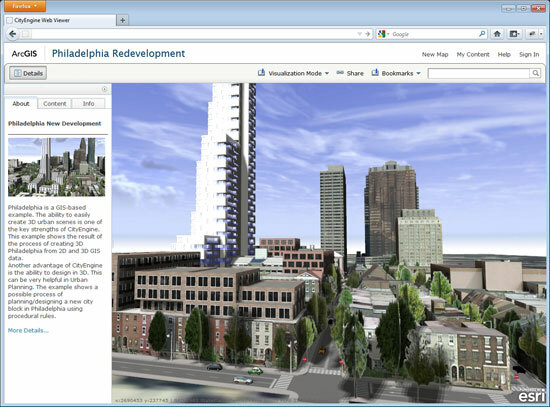 Another view into the future is provided with this prototype showing the integration of Esri CityEngine within the ArcGIS Online map viewer. These capabilities, once integrated into the ArcGIS Online landscape for an organization, will provide better, faster, and more efficient ways to collaborate and understand geodesign in the context of our ever-changing cityscapes and environment. These will also enable broader access to compelling visualization capabilities, as well as focused tools that support targeted geodesign workflows.